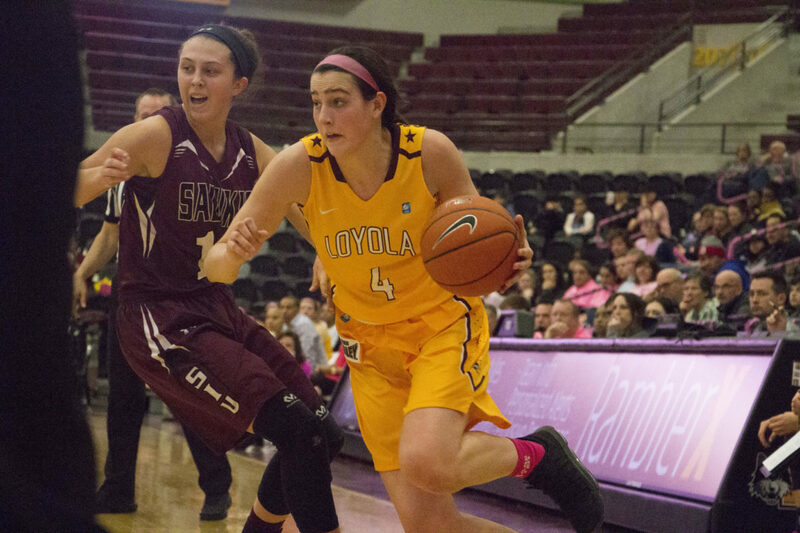 Nick Schultz | The Phoenix Sophomore forward Abby O'Connor had 21 points and nine rebounds in Loyola's 80-54 win over Valparaiso Jan. 6. 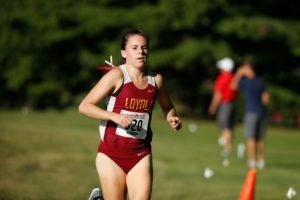 The Loyola women’s basketball team (6-19, 4-10) is currently ninth in the Missouri Valley Conference (MVC), and while the season has been difficult, there are signs of improvement. At the beginning of the school year, the team set three goals: Be top three in conference in rebounds, be top three in field goal attempts and top three in fewest turnovers. They are currently top five in free throw percentage but fall under top five in the other two categories. First-year guard Ellie Rice said the players have been working hard since practice started. Sophomore guard Tiara Wallace said practice is key because they can focus on the things the team needs to work on in order to succeed on the court. She said it’s all about keeping your head up and focusing on what’s important for that game. Head coach Kate Achter said it’s all about consistency. She said what the coaches emphasize now is what they’ve always emphasized: The big task of the game is valuing the basketball. Rice said the only way the players were going to meet their goals was if they did it together and they needed to work together as one unit if they wanted to succeed. “When we come to practice with the right mindset we push each other to always play hard for one another, because when we play as a team that’s when we can really succeed,” Rice said. Teamwork was a theme among all players. Wallace said they enjoy working as a team because they want to see each other succeed. She said it’s not about just one of them but all of them. Achter said she was impressed with the effort the girls have put into meeting these goals. One thing that hasn’t changed during what Achter called a “rollercoaster” of a season was the team’s goals. She said it’s important to have a reachable, consistent goal set from the beginning of the season. Rice agreed with Achter. She said she’s valued the goals from the beginning of the season and they’ve helped aim her focus on something narrow and to succeed at that. The team’s improvement is shown in recent awards. Rice and first-year forward Abby O’Connor have been recognized for their success this season with Missouri Valley Conference Newcomer of the Week awards. While the awards are nice, Wallace said the team still needs to get better. The Ramblers are scheduled to play University of Evansville Feb. 23 followed by Indiana State University Feb. 25.